This post is sponsored by True Chews® Dog Treats and the BlogPaws® Pet Influencer Network™. 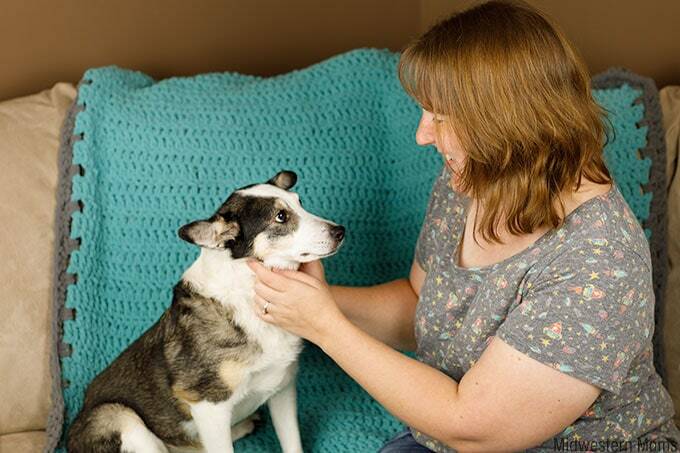 I am being compensated to help share information about the True Chews line of all-natural dog treats, but Midwestern Moms only shares information we feel is relevant to our readers. All statements made reflect my true opinion of the product. True Chews is not responsible for the content of this article. Does your dog love to sit by you on the couch? My dog follows me everywhere and loves to sit right next to me on the couch while I crochet. I thought it would be a great idea to crochet a dog blanket to cover the couch where she lays. My husband and I adopted Daisy about 10 years ago from a shelter. She was our first “baby” after purchasing a house. Since the day she came to live with us, Daisy has been my little shadow. Always following me everywhere I go. Every day is a new journey for Daisy. She may not travel outside our property, but every day she can choose her own adventure. She knows the boundaries of our large yard and anytime we go out, she starts off on a journey to see what sort of animals have crossed into her domain since the last time she was out. She happily trots across our yard investigating, all the while keeping an eye on me and knowing my location. Since Daisy is a very loyal dog, I decided I should make something just for her. She quietly lays by my side on the couch as I make crochet projects after crochet projects. So I decided a soft blanket just for her to cover the couch would be perfect. She loves soft things and I knew that Bernat’s blanket yarn would be the softest yarn for this pattern. Even while I was crocheting the blanket, she was trying to cuddle up with it. Depending on your dog’s size, you may want to alter this pattern. I made it fit Daisy (she is a medium-sized dog) should she want to stretch out and long enough that it drapes over the top and seat of the couch. This way it protects the couch. Row 1: Chain 74. Double crochet into the 4th chain from the hook. Double crochet all the way back. (the chain 3 will count as a double crochet stitch). Total of 70 stitches. Row 2: Turn your work and chain 3. Double crochet across. Total of 70 stitches. Row 3 – 60: Repeat row 2 till you reach 60 total rows. Join in one corner of the blanket. The first row of the border will be single crochets and chains. The pattern will be 2 single crochets and then 2 chains, repeated around. On the sides of the blankets, place your single crochets in the chain 3 spaces of the blanket rows. The tops and bottom of the blanket, you will place one single crochet stitch into one stitch of the row. After 2 stitches, skip 2 by chaining. When you made it around the blanket, slip stitch to join. Row 2: Chain 3. Double crochet 3 times into each chain 2 space on the previous row. Slip stitch to join. Cut yarn and weave in your ends. 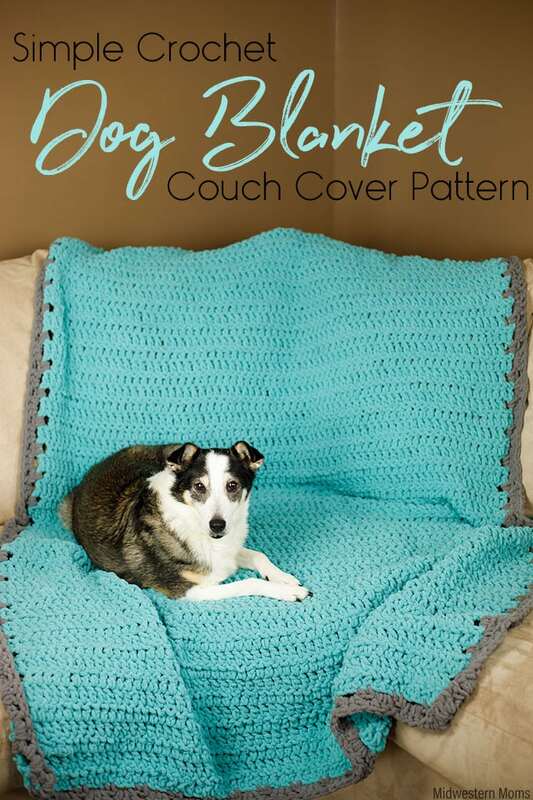 When it is completed, just drape over the couch in your dog’s favorite spot and allow them to enjoy the soft blanket! 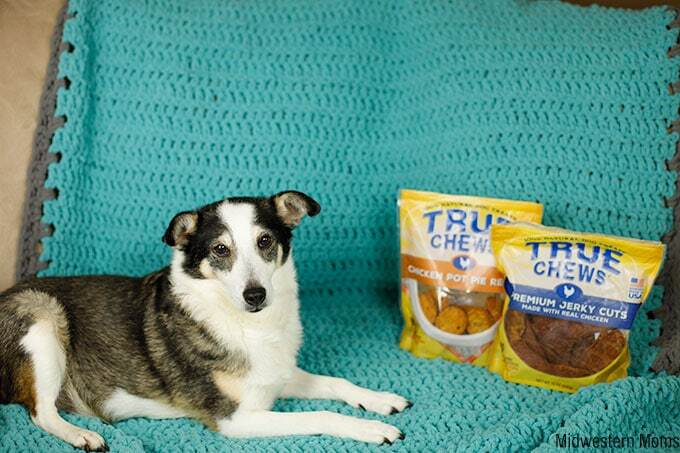 Another thing Daisy has been enjoying lately is True Chews® Dog Treats. The treats are made in the USA and are made from all natural, premium quality ingredients. That means no artificial flavors, no artificial preservatives, and no meat by-products. Just 100% natural ingredients with premium cuts of meat always #1 on the list. Our loyal companions deserve the best. They give us 100% of their love 100% of the time. They are the ones who can put a smile on our face instantly with one look. 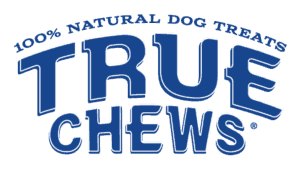 Find True Chews Dog Treats near you! Learn more about True Chews Dog Treats. Follow True Chews on Facebook. I want a dog. Our lab died earlier this year… Hopefully soon we will get a new one! Love that blanket and, the video….definitely reminded me that life is sweeter with a pup! Love the video. I love dogs and ours think they have to have their special blankets too. Also our furbabies loves these treats!! Thank you! Daisy looks so sweet on the blanket and with her True Chews. Love the idea of a couch cover. Our puppy is proving hard on our sofa and this would be a big help.